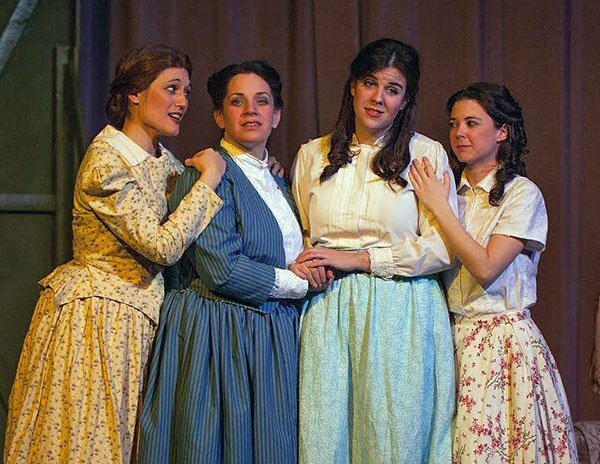 Initially quite certain of herself as the older sister to young Meg, Amy, and Beth, over the course of nine scenes in two acts in Mark Adamo’s Little Women, Jo develops empathy. While this 1998 response to Louisa May Alcott’s novel of 130 years earlier is hardly anti-feminist, the ending suggests Jo’s acceptance of woman’s nurturing nature that some advanced PC types might not bless. Unless re-titled Strong Women, the opera and perhaps the novel stand a good chance of being banned at Bowdoin, along with sombreros. Metrowest Opera mounted the work in an economical production that in terms of scenery did not advance much beyond sheets on strings. Nevertheless, because of the exquisite detail of costuming and wigs, the production functioned admirably in the small space of Lasell College’s Yamawaki Auditorium, a gut rehab of an older theater which left little evidence of its former glories beyond an early Simplex movie projector in the lobby and a stained-glass transom panel hanging on a white wall. The raked seating, officially for 85, occupied about as much space as the 19-piece orchestra and the raised platform (not raised enough, since the standing bass player appeared to be onstage). The draped proscenium arch occasionally opened for vignettes by the “Greek” chorus and the dreamed-of Beth at the piano. Adamo’s first opera became something of an instant hit when Houston Grand Opera premiered it in a studio production. Since then it has been on the boards of 30 major opera houses as well as countless college and community productions. The composer’s manner of combining throbbing and angular 12-tone passages to advance action, and evoke sounds of animals and crying babies with lyrically arching tonal arias stands as his signal method. Drawn from the novel, as well as Transcendentalist favorites such as Goethe and Bunyan, his effective libretto in couplets appeals to critics and audiences alike. John Rockwell’s NY Times review of the 2003 NY City Opera told us that it’s okay for sophisticates to be moved. Because Adamo brings the 19th century to us without coyness or pandering, his work possesses an authenticity that other improvements of the American primitive genre do not. One could understand the style as Sondheim with touches of Copland barnyard scenes and Bernard Hermann slashing. Under Lidya Yankovskaya, the players managed to meander among the composer’s not-so–daunting tone rows without too much creativity of pitch or slacking of concentration. Employing advanced synchromesh, Yankovskaya melded the arias and continuous wet recitatives seamlessly. Yet it has to be noted that fff passages were earsplitting from the band, and from a couple of the singers as well. Words did not always emerge out of the textures from some of the lighter voices. The electric piano, which served an important role in the story, made unpleasant sounds, which were hardly the fault of the player. The 15-member cast I heard seemingly rejoiced in their collective and individual commands of Adamo’s idiom. The characters were exceedingly well differentiated and honestly inhabited. The dominant figure in the narrative, Jo, as Alexandra Dietrich conveyed her on Sunday, was large of personality with an instrument to match. She traced the evolution of the protagonist with polish and star power. The vivid interactions among the sisters illuminated the proceeding like a graphic novel. Mother, father, suitors, aunt, parson and choristers all added substance. Highlights there were aplenty, perhaps the foremost coming in Seth Grondin’s “Kennst du das Land.” Not only was the aria passionately addressed to Jo, but it dramatically changed the trajectory of her character in the opera. Orianna Dunlop made a smashing entrance as Aunt Cecilia—her stage demeanor and old-fashioned contralto perfect. 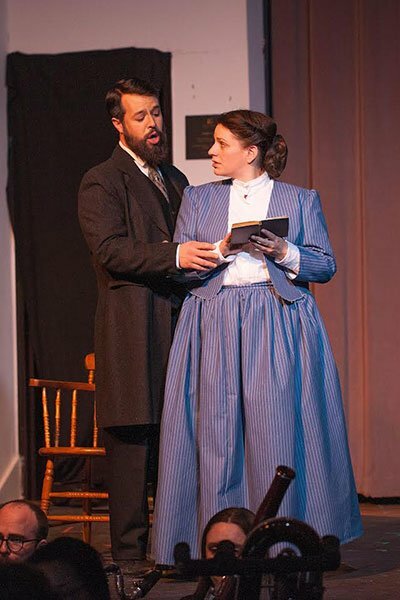 At the piano and on her deathbed, Abigail Krawson, Sunday’s Beth, sickened and died operatically with great pathos and handsome tones without benefit of blood-stained handkerchief. As sister Amy, Laura Intravia brought a bright ping and more than held her own. Megan Roth, looking and sounding every bit the part, made a warm and sonically sumptuous Meg. The other men and the elders equally deserve notice. While starting out rather tentatively—after all, he began by impersonating a youth—Wes Hunter artfully traced Laurie’s developing stature and maturity. He declared his love for Jo with drama, heart, and shining tone in his big aria. The dramatic soprano Britt Brown’s portrayal of Alma March channeled power and determination in a big way. Andrew O’Shannick and Nathan Rodriguez made the most of their moments on stage as Mr. Dashwood and John Brooke, as did the Gideon, Todd McNeel. But throughout all solos and ensembles in which she figured so centrally, Dietrich’s Jo ruled indefatigably. I imagined her in a monodrama such as Erwartung or La voix humaine. Stage director Dana Lynne Varga’s commitment to this production, which extended to inviting the composer to a workshop, triumphed over limitations of space and budget. According to the company, Adamo presided over a weekend residency including a working rehearsal with the whole cast, a sitzprobe with cast and orchestra, and time with individual singers on arias from the opera. He was very particular about characterization and singers connecting to the text. His input was invaluable and inspiring to us all. He has checked back in with us multiple times to ask how the performances went. 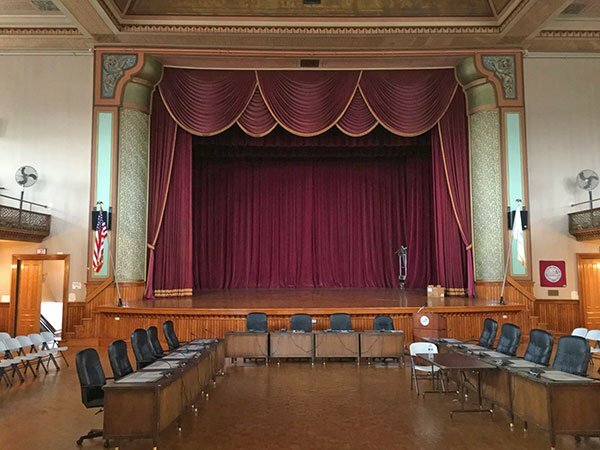 The success has prompted the company to offer an encore performance in the large 19th-century Wiggin Auditorium of Peabody City Hall on Friday at 8pm. The venue has probably not held an opera in 100 years. More information is here.